Panasonic is introducing a second advanced compact camera, the FZ2500. This camera utilizes the same 20.1MP 1" MOS sensor as the LX10, but optimizes video performance with the inclusion of DCI 4K video recording and a true 24 fps frame rate, in addition to more conventional UHD 4K and Full HD recording modes. Also benefitting videographers, this camera includes Panasonic's CINELIKE D and CINELIKE V picture profiles for better grading capabilities, and V-Log L can be added via an optional upgrade. Additionally, high bit rate recording up to 200 Mbps is supported in both MP4 and MOV formats; video can be output over HDMI with a 4:2:2 10-bit signal; there is no recording duration limit; and a built-in ND filter can be used for enhanced control over exposure settings while recording. More than just a video-optimized camera, however, the FZ2500 also sports a slew of specs for stills and movie users, such as a 50 fps continuous shooting rate with an electronic shutter, or 12 fps with a mechanical shutter, and an expanded sensitivity range of up to ISO 25600 for working in dim light. The built-in 20x Leica DC Vario-Elmarit f/2.8-4.5 lens covers a 24-480mm equivalent focal-length range, and 5-axis HYBRID O.I.S.+ controls the effects of camera shake for sharper handheld shooting. A free-angle 3.0" 1.04m-dot LCD touchscreen permits intuitive control and viewing ease from a variety of working positions, and a 2.36m-dot electronic viewfinder is also available. Additionally, built-in Wi-Fi also supports wireless image sharing and remote camera control. ...but the question is...is this the rx10 mkii sensor ?...and will it have good 1080/120p ? Panasonic use different names for different regions. First leak was from Asia. Please use full focal range in 4K & HD, even if only with OIS off. Built-in ND is definitely a plus. i agree....that 37mm cropped sensor 4k readout was the biggest fz1000 turnoff ! I think it also has a touch screen. I also noticed a microphone jack, AND a headphone jack! 3 Extra function keys on the barrel. The hiker/climber in me looks very much forward to this. I hope the 4k is from the whole 20MP sensor; no crop, and 24mm wide angle! (very important). It would be cool if Panasonic would crop the 20mp down to 4k on the first part of the zooming action, allowing to to zoom without moving the lens, without increasing the f-stop. So the first 24-37mm zoom part is a constant F 2.8. The 4k long end would be hovering around 740mm, great! Since these specs are so close the the RX10-3, I hope the price still will be lower then the Sony. Looking forward to it. NDs are sweat addition. The new LUMIX FZ2500 evolves beyond the limitation of conventional compact cameras by providing outstanding video recording capabilities. One of the most prominent advances is unlimited 4K video recording (Cinema 4K: 4096x2160 / 24 fps and QFHD 4K: 3840x2160 / up to 30 fps) in MOV/MP4. The LUMIX FZ2500 is also capable of recording Full-HD videos with an ultrahigh bit rate of 200 Mbps (ALL-Intra) or 100 Mbps (IPB) without any recording duration limit. Users can freely choose the format from MOV, MP4, AVCHD Progressive and AVCHD at a variety of frame rates according to the application. For global business by professional users, the system frequency can be flexibly selected from 59.94 Hz (23.98 Hz) / 50.00 Hz / 24.00 Hz. 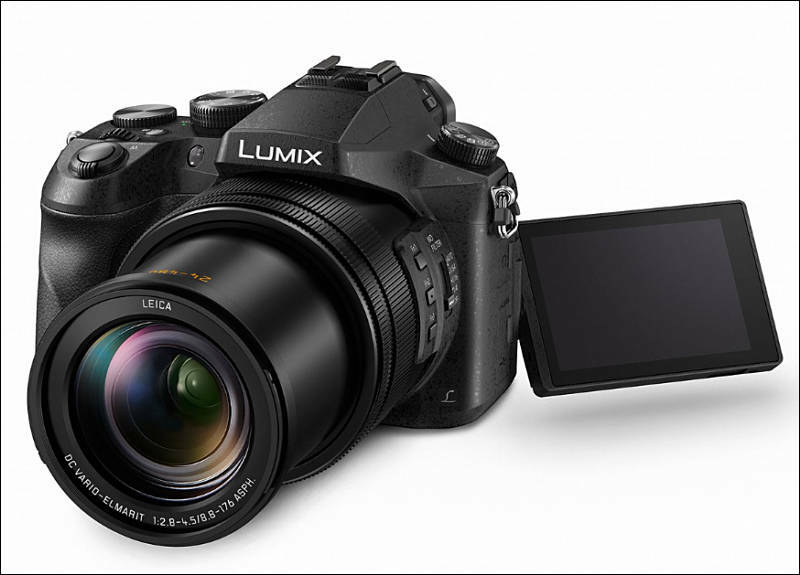 The LUMIX FZ2500 is also capable of live image output to the external monitor via an optional micro HDMI cable simultaneously while recording video. For more unique video expression, VFR (Variable Frame Rate), Slow & Quick motion, and Dolly Zoom are also available as well as a variety of practical functions required for professional video recording. The LUMIX FZ2500 packs a host of advanced functions and technologies that let users capture the unmissable moments. The Contrast AF System features DFD (Depth From Defocus) technology and excels in both speed and accuracy by exchanging digital signals between the camera and the lens at max. 240 fps, resulting in ultrafast auto focusing of approx. 0.09 sec*2. The burst shooting performance is also improved to achieve 12 fps (AFS) / 7 fps (AFC), for up to max.100 (JPEG) / 30 (RAW) images. Taking advantage of 4K technology, users can capture fleeting photo opportunities at 30 fps to save as a 4K PHOTO. Panasonic’s unique technologies further enrich the user's photographic experience. In addition to the Post Focus function, newly integrated Focus Stacking enables to adjust the depth of field after shooting by simply selecting the focusing area. The LUMIX FZ2500 features an OLED LVF (Live View Finder) with 2360K-dot equivalent high resolution with approx.2.18x / 0.74x (35mm camera equivalent in 4:3) magnification capability. The large, free-angle 3.0-inch approx.1040K-dot touch-control monitor with approx. 100% field of view makes shooting easier at either a high or low angle. Wi-Fi® connectivity lets users connect the camera to smartphone or tablet to expand the flexibility in shooting, storing, and sharing images. With its exceptionally high video performance, the new LUMIX FZ2500 defies comparison with any conventional compact cameras, satisfying even prosumers and advanced amateurs. The LUMIX FZ2500 features a LEICA DC VARIO-ELMART lens system with 20x optical zoom (35mm camera equivalent: 24-480mm) and high-speed F2.8-4.5. Comprised of 16 lenses in 11 groups including 1 UHR (Ultra High Refractive Index) lens, 4 ED (Extra-low Dispersion) lenses and 5 aspherical lenses, the lens system boasts high optical performance with minimum ghosts and flaring. This lens system adopts an inner zoom structure with guide-pole mechanism. The guide-pole mechanism minimizes image shifts in zooming and is commonly used in professional camcorders. Together with the inner zoom structure, which realizes exceptional barycentric stability, image shift is dramatically suppressed by 80% compared with the FZ1000 to offer smooth, stable zooming. A coreless DC motor also enables slow, constant zooming from wide to 20x telephoto. Focus tracking performance in zooming is also improved. A 9-blade aperture diaphragm achieves a soft, rounded defocus, smoothly catching up with sudden changes in brightness thanks to the use of a new galvanometer-type actuator, which is also used in professional camcorders. It assures smooth, seamless iris control even while zooming. By combining the built-in ND filters, 4 setting modes for ND filters are available with direct switch operation: -2EV(1/4), -4EV(1/16), -6EV(1/64) and AUTO. Users can record videos while keeping the exposure level the same with a fixed shutter speed or with a fully open aperture even in high brightness. The LUMIX FZ2500 boasts an exceptional video recording performance that has never been seen before in any compact digital camera. It is capable of unlimited 4K video recording (Cinema 4K: 4096x2160 / 24 fps and QFHD 4K: 3840x2160 / up to 30 fps) in MOV/MP41. The LUMIX FZ2500 is also capable of Full-HD video with an ultrahigh bit rate of 200 Mbps (ALL-Intra) or 100 Mbps (IPB), with no limit on recording duration.1 Users can freely choose the format from MOV, MP4, AVCHD Progressive and AVCHD at a variety of frame rates according to the application. For the global business of professional users, the system frequency can be flexibly selected from between 59.94Hz (23.98Hz) / 50.00Hz / 24.00Hz. The LUMIX FZ2500 is also capable of live image output to the external monitor in 4:2:2 / 8-bit via an optional micro HDMI cable simultaneously while recording video. Even 4:2:2 / 10-bit is available which is suitable for professional video making that requires serious monitoring of footage. Users can choose to output only the recording content or the content with setting menus individually depending on the display. To elevate the video expression performance even more, a variety of effects are available on the LUMIX FZ2500. The VFR (Variable Frame Rate) lets users record overcranked / undercranked video, all in Full-HD. Max.5x slower effect is available in 24p at 120 fps.. With the newly added Slow & Quick, users can apply a slow or quick motion effect with a press of the Fn button during recording. It is easy to activate 50% slow motion (120 fps) or 200% quick motion (30 fps) recording mode while recording at 60 fps. It is also possible to change the background’s angle of view and make it wider without changing the size of the main subject with a Dolly Zoom. Time Lapse/ Stop Motion Animation video can also be produced inside the camera. In response to the demands of the cine production market, Panasonic offers a paid software upgrade service for the LUMIX FZ2500 to comply with V-LogL video recording with the purchase of Upgrade Software Key DMW-SFU1. Log recording offers exceptional flexibility as well as a wider dynamic range for color grading in the post-production process and V-LogL features log characteristics with 12 steps. V-Log / V-LogL have been developed to feature a similar characteristic curve to Cineon, which is a characteristic curve of film digitalization. Both V-Log and V-LogL have the same characteristic curve, and the LUT (Look Up Table) can be utilized in common. The LUMIX FZ2500 incorporates a large, 1-inch High Sensitivity MOS Sensor with 20.1-megapixel high resolution. This large MOS Sensor boasts a high S/N ratio, resulting in a dramatic reduction of noise even when shooting at ISO 12,800. The rich amount of light helps to produce an impressive defocus with a shallow depth of field. Together with the high-performance image processor Venus Engine, high image quality is achieved by optimizing sensitivity, resolution, color reproduction and gradation. The advanced noise reduction system detects edge parts, smooth parts and gradation parts and applies appropriate noise reduction individually. The result is sharp, clear images with precise color reproduction. The LUMIX FZ2500 incorporates a dedicated linear motor into the focus system to achieve ultrahigh-speed AF with DFD (Depth From Defocus) technology which shortens the focus time. It calculates the distance to the subject by evaluating two images with different sharpness levels at a high 240-fps signal exchange speed. As a result, the LUMIX FZ2500 achieves ultrahigh-speed AF of approx.0.09 sec*2 and high speed burst shooting at 12 fps (AFS) / 7 fps (AFC) to capture fast-moving subjects in crisp focus up to 100 (JPEG) / 30 (RAW) images. Thanks to this 4K technology, users can experience 4K PHOTO to capture fleeting photo opportunities at 30 fps by extracting the frame with the most photogenic image out of the 4K burst file to save as a photo. Plus, multiple images can be saved as 4K PHOTO shots all at once in the LUMIX FZ2500. A maximum of 150 frames in five seconds following a designated frame can be saved. Users can check these images on a large PC monitor and select the best shot after shooting. The LUMIX FZ2500 comes with the Post Focus function that lets users select the in-focus area even after shooting. This is helpful especially in macro shooting where strict focusing is required or for changing expressions by changing the focused subject. This function was developed by combining high-speed, high-precision DFD (Depth From Defocus) auto focus technology and 4K technology. The newly integrated Focus Stacking function enables users to adjust the depth of field after shooting by combining multiple images shot with Post Focus function inside the camera. Users do not need to focus severely while shooting because they can get the image with the defocus that they want, or a pan-focused image, by simply selecting the focus area after shooting. This is beneficial when shooting macro shots of insects, small accessories and so on. The 4K PHOTO and Post Focus menus are available on the drive dial for users to activate them more quickly. 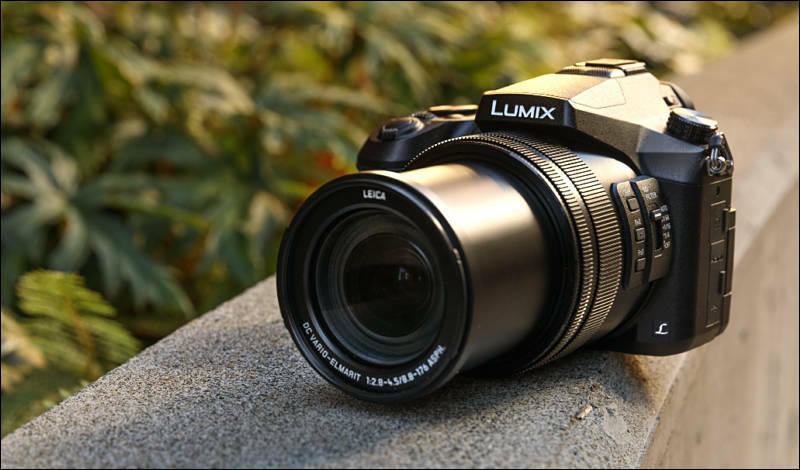 The LUMIX FZ2500 offers both a sleek, solid exterior design and intuitive control. The dual dial control system around the barrel of the large-diameter LEICA DC lens enables focusing and zooming, and the 4 ND filter setting modes can be changed quickly with a switch that is also located on the lens barrel. The well-defined grip provides a stable hold with minimum fatigue despite its substantial weight. The front/rear dual dial system enables direct setting of the shutter speed and aperture. And the optimal dial, button, lever and switch layout allow intuitive control with comfort in both photo and video shooting. The LUMIX FZ2500 has a large LVF (Live View Finder) with a high magnification ratio of approx. 2.18x / 0.74x (35mm camera equivalent in 4:3). The high-precision, high-speed OLED (Organic Light-Emitting Diode) display features 2,360K-dot high resolution and 100% field of view. Adoption of the OLED for the LVF achieves high-speed response with minimum time lag of less than 0.01 sec as well as 10,000:1 high contrast for exceptional visibility. With an eyepoint of approximately 20 mm, it also offers high visibility with comfort for users wearing glasses. It is always sharp and clear from the center all the way to the corners. Equipped with a static-type touch-control system, the 3-inch free-angle rear monitor with 1040K-dot high resolution features approx.100% field of view. It tilts up and down by 270 degrees, which enables shooting at either a high or low angle even easier. The touch-control system lets the user immediately focus on the subject and even release the shutter by simply touching the screen. Touch Pad AF makes it possible to change the focus point while keeping an eye on the subject through the viewfinder when the frame is fixed. 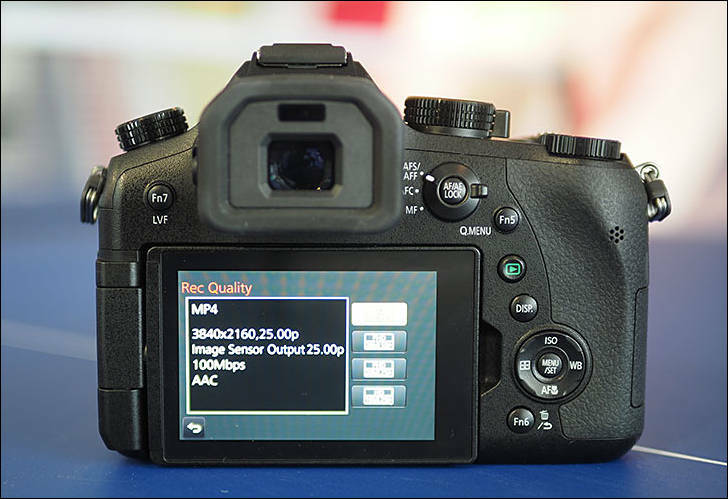 It is also useful in after-shooting operations such as cropping 4K PHOTO shots or setting Post Focus. The LUMIX FZ2500 comes with a variety of connection terminals for more flexible shooting options. The 3.5 mm microphone jack is for high-quality audio recording using an external microphone, and the 3.5 mm headphone jack lets the user monitor the audio recording while shooting video in real-time. For reliable recording of rich video, the LUMIX FZ2500 complies with UHS-I Speed Class 3 (U3). The UHS-I Speed Class 3 (U3) guarantees a constant minimum write speed of 30 MB/s to respond to market needs for 4K video. 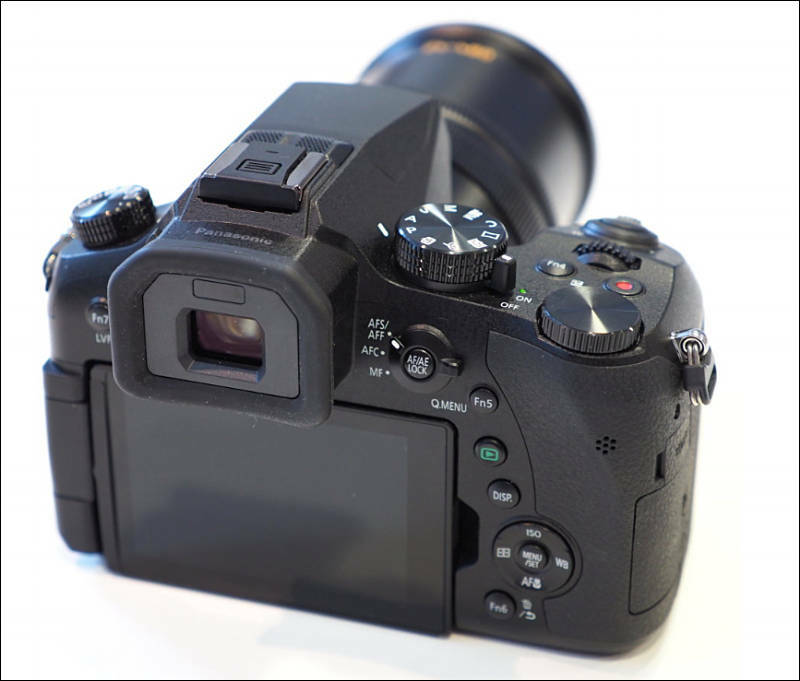 The SD Card slot is located at the side of the camera for users to change smoothly even when the camera is on a tripod. The LUMIX FZ2500 features Wi-Fi® connectivity (IEEE 802.11 b/g/n) to offer a more flexible shooting experience and instant image sharing with easy operation. Once the camera is connected to a smartphone or tablet installed with Panasonic's dedicated application software Panasonic Image App for iOS / Android, users can shoot, browse, and share images remotely. This one simple. You have demanding stages - motion estimation and CABAC encoding need 4x and sometimes more calc in 4K res. So does this camera do 4.2.0 or 4.2.2, 8 or 10 bit internal. I haven't being able to find that information? Any ideas? All 422 is HDMI output only. Period. By idea, it is Sony sensor, so all behavior is same. What size filter threading does it have? Can we attach a wide angle adaptor to recover some wide angle video?
" There’s also a 67mm screw thread at the front of the lens for attachment of external filters." And with the non moving (when zooming) barrel; I think a Wide angle lens adaptor can be used to have more wide angle in 4k. Furthermore I think with the Cinema 4k (4096 pixels wide), it gains another ~2mm.